By using chia seeds to boost the nutritional value of your breakfast, you’re strengthening your body’s defense system so it can handle whatever the day throws at you. Eggs are a nutritious source of quality protein with plenty of vitamins and minerals that are essential for good health. They’re inexpensive, easy to cook, and so versatile that you can make many meals based around eggs. Eggs are an especially great breakfast food because they can be cooked alone or added to other foods to create pancakes, omelets, and more, providing your body with some of the nutrients you need throughout the day. Although in the past, there was some concern about the fat contained in eggs, it’s now widely accepted that an egg a day is okay — and recommended for good nutrition. To make boiled eggs, fill a small saucepan with water and bring it to a fast boil. Using a slotted spoon, slowly add the eggs to the saucepan. For soft-boiled eggs, boil the eggs in water for 5 minutes; for medium-cooked eggs, 7-1/2 minutes; for hard-boiled eggs, 10 minutes. To serve your eggs, crack open the eggs and add the chia seeds. To make poached eggs, fill a wide saucepan with water and a pinch of salt and bring to a boil over medium heat. When the water is softly simmering, gently crack the eggs into the swirling water. For a soft-poached egg, cook for around 2 minutes; for a firm egg, 4 minutes. Remove the eggs from the water with a slotted spoon and dab off excess water with paper towel. Sprinkle with chia seeds before serving. To make fried eggs, in a medium frying pan, add the olive oil and slowly crack the eggs onto the pan over medium to low heat. As the oil gets hotter, the eggs will start to change color; when they turn white, spoon some of the hot oil back over the yolks of the eggs. If the oil starts to spit, turn down the heat. When they are cooked to your liking, take the pan off the heat and remove the eggs with a slotted spoon. 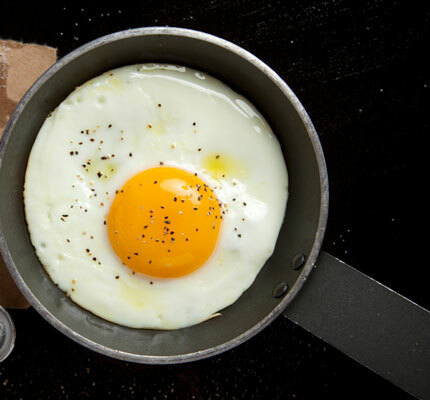 Dab the eggs with paper towel to remove any excess oil and sprinkle the chia seeds over the eggs before serving. Per serving (boiled and poached): Calories 160 (From Fat 95); Fat 11g (Saturated 3g); Cholesterol 372mg; Sodium 142mg; Carbohydrate 2g (Dietary Fiber 0g); Protein 13g. Per serving (fried): Calories 398 (From Fat 334); Fat 38g (Saturated 7g); Cholesterol 372mg; Sodium 143mg; Carbohydrate 2g (Dietary Fiber 1g); Protein 13g. In a large bowl, break the eggs and add the milk, chia, salt, and pepper. Whisk the mixture until the whites and yolks are well mixed. In a medium saucepan, place the butter and add the egg mixture. Stir continuously over low heat using a flat-bottomed wooden spatula until the butter has melted and the eggs are soft and creamy. Remove from the heat and stir through again before serving. Per serving: Calories 184 (From Fat 114); Fat 13g (Saturated 5g); Cholesterol 380mg; Sodium 225mg; Carbohydrate 3g (Dietary Fiber 0g); Protein 14g. Using a slotted spoon, slowly spoon the eggs into the water, and boil for 10 minutes. Drain the water from the saucepan of eggs and fill with cold water, allowing the eggs to cool down. When the eggs are cool to the touch, roll them softly along the countertop, cracking the shells. (This makes it much easier to remove the shells.) Peel all the shells off the eggs and rinse with cold water. Slice the eggs in half lengthwise, and remove the yolks; place the yolks in a small bowl. Mash the yolks using a fork, and add the mayonnaise, parsley, mustard, salt, and chia, mixing well. Spoon the mixture back into the egg whites where the yolks had been. Sprinkle with paprika, and refrigerate for at least 1 hour or until ready to serve. Per serving: Calories 127 (From Fat 94); Fat 11g (Saturated 2g); Cholesterol 189mg; Sodium 217mg; Carbohydrate 1g (Dietary Fiber 1g); Protein 7g. If you like spicy foods, try adding 1 teaspoon of cayenne pepper to the egg yolk mixture and mix thoroughly before transferring back to the egg whites.